DanWarp - Dan Schneider: Sam & Cat PREMIERES!!!!! It's hard to believe that I have a new TV show – Sam & Cat – premiering TONIGHT (8:00 PM on Nickelodeon – 7 central). It's been a while since I've done my FUN FACTS, but tons of people have been asking me to do them for the first episode of Sam & Cat, so here goes! To anyone who's watched my shows over the years, it comes as no surprise that my new show has its roots in one of my past shows (actually, in this case, two of my past shows). Every show I've ever created starred an actor or actress from a prior show. It all started with All That. Kenan Thompson and Kel Mitchell were so freakin' great on All That, we decided to give them a shot at their own show – and Kenan & Kel was born. Since then, you can trace every TV show I've created back to one of my previous shows. That's not a formula I ever "thought through" – it just sorta happened... and kept happening. As you probably know, iCarly and Victorious were very successful shows for Nickelodeon. They were the top two live-action shows on the network, after Drake & Josh and Zoey 101 ended. There were two main factors that lead to the creation of Sam & Cat. First, I love BUDDY COMEDIES. You can't beat the fun energy of two great, comedic actors working together as a team. Two of the most popular shows I created were Drake & Josh and Kenan & Kel. And for a long time, I've thought it would be great to make a show like those – a buddy comedy – but with two GIRLS. Thanks to Jennette McCurdy's talent (plus the talent of many amazing comedy writers), SAM PUCKETT became a hugely popular character on iCarly. And thanks to Ariana Grande's talent (plus the talent of many amazing comedy writers), CAT VALENTINE became a hugely popular character on Victorious. It all came together in my head, one day, when I was in my office, talking with a senior Nickelodeon executive named Tracy Katsky – one of the best, most respected and well-liked TV executives in the entertainment business. We were sitting around, talking about what my next show might be – and with Tracy's help, the idea for a new buddy comedy called Sam & Cat was born! I created the "Sam Puckett" character when I wrote the pilot for iCarly. At that time, I had no idea that, 3 years later, I'd create the character "Cat Valentine" in the Victorious pilot script. So, by accident, I created two characters who were ideal to star together in a fun, crazy, new buddy comedy. Sam + Cat = the perfect pairing for a great, hilarious TV show. Now, Sam & Cat hits television TONIGHT on Nickelodeon at 8:00 PM (7PM central). The show is made by the same, incredible creative team that brought you many of my past shows – the same talented, creative people who helped me produce Drake & Josh, Zoey 101, iCarly, Victorious, and more. If you read on, it will reveal some information about what happens in the first episode of Sam & Cat I'm not going to reveal too much, but still... you can wait and read these Fun Facts after you watch Sam & Cat. If you're super-fan, you'll probably enjoy reading this stuff. But if you're a casual fan, you might find it boring. And remember: Feel free to DISCUSS the episode here, in the comments below. When you're done reading all this, please tell any of your friends about these Fun Facts, and that they can come here to read them. Thanks! Scene begins on a street, with Sam driving up on her motorcycle, stopping at a food truck. • If you watched iGoodbye (the final episode of iCarly), you know this motorcycle. It's the 1964 "Sterling" that Spencer gave to Sam. I intentionally set this up in the last iCarly. I knew that Sam would be traveling to Los Angeles, since that's where Cat Valentine lives. And I wanted to give Sam some continuity from her life in Seattle to her new life in L.A. That's one of the reasons I set up Sam's new motorcycle in the final iCarly, iGoodbye. • The two boys looking for their missing cat, Pawsley, are actually brothers in real life. • In Cat's bike basket, you'll see Mr. Purples, her little stuffed purple giraffe. You've seen Cat with Mr. Purples before in several episodes of Victorious, and in her videos on The Slap. • The street where we filmed this scene is the same location where, in Drake & Josh, Josh tried to drive his new yellow car (a stick shift) with Drake and Megan. It's also where we shot the giant cupcake scenes in the Victorious episode "Terror on Cupcake Street." • When Cat opens the lid of the green garbage can, I didn't expect the lid to fall off. But it did, every time. So, I added the line "Oh the hinge!" for Cat to say when it falls off. • Notice the name printed on the garbage cans, and on the garbage truck: Filth In Motion. We had to come up with a name for the trash company, and we thought Filth in Motion was funny. • Some fans have asked me, "But wait! Didn't Sam and Cat already meet in iParty With Victorious?" The answer is: yes and no. True, both characters appeared in iParty... but they never really interacted. So, to me, this is their first real meeting – and I love that it happens in a moving garbage truck. • While Sam and Cat are in the garbage truck, if you'll notice, the garbage is closing in (compacting) on the girls. "I'm never that far, no matter where you are... believe it, we can make it come true..."
• As a kid who grew up loving television comedy, I always felt the power and importance of a great theme song. Sadly, over the past 15 years, theme songs have slowly been disappearing from TV shows in the primetime world. They're not completely gone yet, but they're fading into extinction. Luckily, a few showrunners today fight the big networks and win approval to have a theme song. An example is The Big Bang Theory – a great show with a perfect theme song that gives the show its soul. Those first few bars, "Our whole universe was in a hot dense state..." make you smile and want to sit down and watch the show. Try to imagine The Fresh Prince of Bel Air or Full House without their great theme songs! For the Sam & Cat theme song, I went to our resident musical genius, Michael Corcoran (Backhouse Mike) who's created all my recent shows' theme songs. I first met Michael through Drake Bell, when they wrote the them song for Drake & Josh. Michael knows how important theme songs are to me and WOW, he came through again! When he presented me with the theme song to Sam & Cat called "Just Fine" – I listened to it once... then a second time... and then I said, "Brilliant – that's IT." It's just great. It sounds like a classic TV theme song, but somehow fresh and contemporary at the same time – an instant classic. It makes you feel good and happy, and it makes you want to sit down and watch a half-hour of fun television. So, thank you Michael, for your musical genius again. I hope you love the main titles (that is, the theme song plus the pics and video clips on the Pear Pad) as much as we all love it here at Schneider's Bakery. It's a great collection of fun images from the show. The POST PRODUCTION WORK (making everything work properly on the Pear Pad) took a ton of time and care. Luckily, we have the best post production team in Hollywood. Thanks to Joe, David, Jeff, and the whole post team! • When you watch the main titles, can you guess what object Sam is using to break the glass bottle? Scene begins outside in a parking lot, with Cat lying on the pavement as Sam dries her clothes with a gasoline powered leaf blower. • Cat informs Sam that she (Cat) lives with her "Nona" – her grandmother. The other writers and I from Victorious set this up – Cat's living situation – in one of the later episodes of Victorious titled "Star-Spangled Tori". (Side Note: The character is named "Nona" because that's what Ariana calls her own grandmother, in real life). 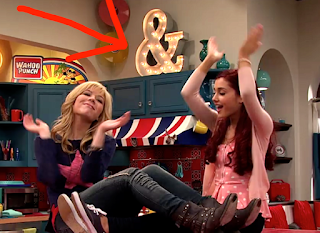 • As you'll see, this first episode of Sam & Cat was directed by Steve Hoefer. He's an amazing director, incredibly hard worker, and one of the nicest guys you could ever meet. Steve also directed the pilots for iCarly and Victorious. Scene begins in Cat's grandmother's apartment (Nona's), as she pours a glass of lime water, and Sam comes out wearing a very un-Sam-like robe. • If you could buy a lock of hair from any celebrity, whose hair would you want the most?!? • Not many characters on TV shows get introduced by being pushed into their first scene in a grocery cart while trapped in a burlap sack. Ladies and gentlemen, meet "NONA" – played by the fantastic Maree Cheatham. We all love Maree, here at Schneider's Bakery. If you want to see just how experienced an actress Maree is, check out her IMDB page – impressive! • Maree insisted that we didn't use a stunt double for her fall out of the grocery cart onto the couch. She wanted to do it herself. I think Maree's having a BLAST playing the fun, wacky, bizarre comedy we do here at Schneider's Bakery. After appearing in dozens of TV shows, I have a feeling she's having the most fun of her career, here with us on Sam & Cat. Scene begins with Sam asleep on Cat's sofa bed, late at night. • Many friends of mine who've seen the first episode of Sam & Cat are SO CURIOUS as to how we did the bit where Sam gets folded up into the sofa bed. Even my good friend Steve (exec producer of The Big Bang Theory) was all, "How the heck did you guys do that?!" Guess what. Even I don't know how we did it! I wrote the bit, but it was our genius special effects guys and art department who figured out how to make it happen. All I know is... it's hilarious to see happen. • It wasn't easy for Ariana to lift the sofa bed out with one hand (to free Sam), but she did it! Scene begins with Cat coming home from school, and finding Sam making something in the kitchen. • When my wife Lisa saw the first episode, she loved the shirt that Sam wears in this scene, so she bought one for herself! Scene begins with Sam and Cat running fast out of the apartment into the atrium, rushing to get to Elderly Acres. • As you can see, Sam and Cat live in apartment number 22. That number has a special meaning. Can you guess what it is?? • The kids who played Max and Chloe (the young kids who Sam and Cat babysit) did such a great job in this episode. I'm really glad when I find kids who can give me "real acting" – as opposed to "kid TV show" acting, which I always try hard to avoid. These two kids were real pros. And their little brother, "baby Darby" was a good actor, too... even though he's only 7 months old. Scene begins with Cat running into Elderly Acres, bringing in the younger kids, with Sam following them in. • The kids who played Max and Chloe loved riding that red scooter. They both wanted to keep doing more takes. Although scooters are usually for people who have trouble walking, kids seem to LOVE THEM. I bet the companies who make these kinds of scooters could have a lot of success marketing slightly smaller versions for kids. • When I get older, if I ever need to move to a retirement home, I want to live in one like Elderly Acres. Being in my 70's or 80's and playing Twister... getting tattoos... hopping in a swimming pool and watching movies... sign me up! Scene begins with at the drive-through window of Inside Out Burger. • I first invented the restaurant Inside Out Burger for an episode of Drake & Josh. Since then, I think I've mentioned Inside Out Burger in Zoey 101, iCarly, Victorious, and now Sam & Cat If you live in California, you probably have a good idea what real fast food restaurant Inside Out Burger is based on. Hint: It rocks. • How freakin' CUTE is that baby in the scooter basket?!? • The baby in this episode ("Darby") is a twin. When you're making a TV show or movie and you need a baby, you always try to cast TWIN babies. That way, if one of them gets fussy, you just switch 'em out! Scene begins back at Elderly Acres with Cat talking to her grandmother, Nona. • Nona's soup recipe: Open the can, pour it in the bowl, put it in the microwave. Quite a recipe. It's so funny when Cat hears that, then says, "Wait, slow down!" • Be honest: If you could have Sam Puckett give you a tattoo of a chicken leg on your arm, would you let her do it? Think about it. Scene begins back at Inside Out Burger with the two kids ("Max" and "Chloe") talking to the drive-though guy. • The drive-through guy is played by Adam Tait. He's our dialogue coach on Sam & Cat (and also was on iCarly and Victorious, too). His job is to rehearse with the actors, and help them with their dialogue. Adam also happens to be a GREAT ACTOR himself, and one of the nicest guys ever. • It was really hot on the day we shot this scene. We all felt so bad for the actor who plays the manager of Inside Out Burger. He had to chase that scooter around, take after take. Some of the sweat you see on him is REAL. Scene begins with Cat walking into the atrium, with Sam, on her way back to her apartment. • Are you ready for this? As I'm typing these Fun Facts right now, our costume designer (Kris) is sitting near me. She tells me that the pink dress that Cat is wearing... she's wearing BACKWARDS. I asked why. She told me, "We thought it looked better that way." Go figure. • We were all surprised when Cat GASPED and said, "The kids!" See if you can guess why we gasped. Scene begins back at Inside Out Burger with the two kids ("Max" and "Chloe") riding the scooter, being chased by the manager. • We had rehearsed these Inside Out Burger scenes all week... and at the last minute I had the idea to give the manager a stick with a flashing police light on top. Our fantastic prop department created the prop fast, so it made it into the show! • There's a nice little Star Wars reference in this scene (for the fans who are as nerdy as I am). • During the part where Sam and Cat are giving the man "their version" of CPR... notice a reaction shot of the baby. It's so great because even that 7-month-old BABY is looking at Sam and Cat like they're insane. Scene begins back in the apartment – Cat is on the couch with the kids, playing a video game, while Sam is in the kitchen area with Dice. • Can you guess what video game Cat is playing with the kids? • How much would you pay for a Ziplock bag of Sam Puckett's hair? Should we give some away to fans? How about the Kleenex that Dice wants from her? Would you buy that? • After the woman says "A hundred and fifty bucks" -- it's soooo funny how Sam goes, "Whaaaaaaaaat?" – Jennette McCurdy is just a brilliant comedic actress – that's all there is to it. • I laugh every time I watch Cat yell, "Shut up, who is she!" Ariana Grande = nuclear funny. Sam and Cat are on a motorcycle together, cruising along a busy street. • This final scene teaches us 3 very important things if you're riding on the back of someone's motorcycle: (A) Don't tickle the driver. (B) Don't put your fingers in the driver's ears. (C) Don't play bongo drums on the driver's helmet. These are important thing to remember! And that's all the Fun Facts for the very first episode of Sam & Cat I'm so psyched about the premiere of this new show, for many reasons. I'm pretty sure that Sam & Cat is the first TV show where the two leads come from two previous hit TV shows – a DOUBLE spin-off. We think that's pretty amazing. I'm incredibly proud of both iCarly and Victorious – and everything those shows accomplished – so it makes me really happy that part of those two shows will live on in Sam & Cat. If you're between the ages of 6 and 14, I feel pretty sure you're going to love Sam & Cat (whether you were a fan of iCarly and Victorious or not). And for the older fans who have fond memories of Drake & Josh and Kenan & Kel, I feel sure that Sam & Cat will make you laugh a lot. As always, my goal isn't to just make a popular "kids show." I like to make television that the whole family can watch together. On Nickelodeon, kids are always the main target audience – I'll always respect that – but if I can also get the older kids, college kids, parents, and even grandparents to laugh along... that's what makes me feel proudest. I miss the family TV comedies I used to watch as a kid with my mom, dad, and sisters, so I hope that Sam & Cat can be a show like that for you and your family. Special thanks to everyone who worked to make iCarly and Victorious such special, wonderful shows. Without them, there would be no Sam & Cat! Please have fun watching the show – tomorrow (Saturday) night at 8:00 PM on Nickelodeon (7:00PM central) -- like I haven't said that enough! On Twitter, my name is @DanWarp. Please let me know what you think of the the new show!